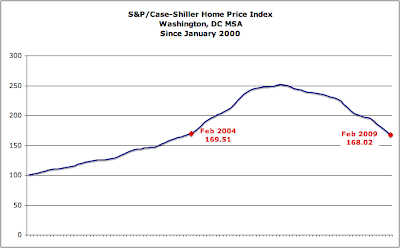 The S&P/Case-Shiller Home Price Indices report for February 2009 was released two days ago. Although prices continue to decline, the report says "the pace of the decline in residential real estate prices slowed in February." "...shows continued broad based declines in the prices of existing single family homes across the United States, with 10 of the 20 metro areas showing record rates of annual decline, and 15 reporting declines in excess of 10% versus February 2008. For the first time in 16 months, however, the annual decline of the 10-City and 20-City composites did not set a new record." 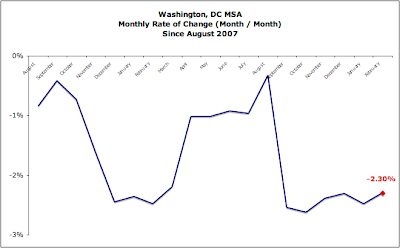 Unfortunately, the DC area's market was not one of the 16 metro areas showing improvement in monthly returns. YoY, prices fell 19.19% and, from January to February, prices declined 2.3%. 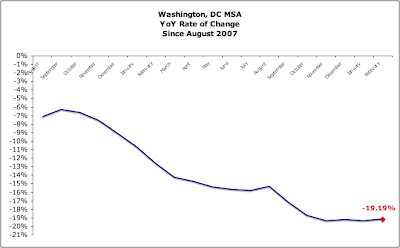 The DC area's home price index is close to that of February 2004. "Unfortunately"? Dropping prices are not unfortunate if you are a renter looking to buy. Meanwhile Capitol Hill is like an impervious zone--haven't seen any price drops, and everything with a roof sells in a month. Crazy. You know, it's really strange. I don't know if it's run-down foreclosures, soft-spots in the further reaches of Capitol Hill, or what, but I rarely see any decent house on the market for more than a month or so. The row house across the street just sold for 20% more than it was purchased two years ago, and talking to several couples who've either just bought, or are hoping to buy on the Hill, there are still biding wars going on. Maybe that's just in the $400-600k range. I'm open to the possibility I'm blinkered by wishful thinking, but it sure doesn't seem that way. It's possible that it's price point sensitive.